Santam Agri indicated to Grain SA that they would like to become involved in the Jobs Fund Project, From Subsistence to Abundance, and they requested that we put a funding request to them. We decided to request sponsorship for training manuals on the safe use and storage of maize, GPS devices to be used by the mentors, and threshing machines for the farmers who are achieving high yields. Over the past number of years, the Maize Trust has funded research, done by Cape Peninsula University of Technology, on mycotoxins and the effect they have on human health. 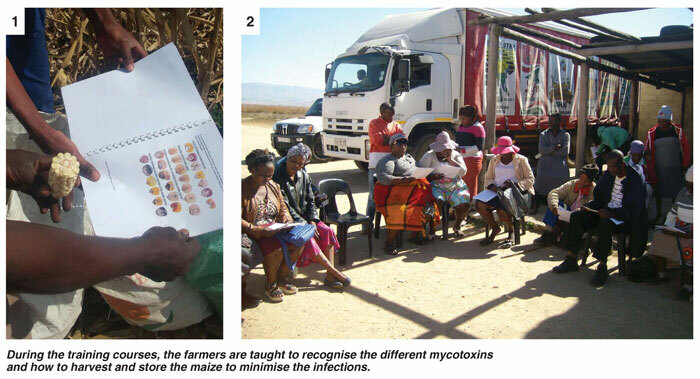 During 2017, the Farmer Development Programme was able to access a series of articles on these Mycotoxins and publish them in the Pula Imvula (where they are translated into six languages). It is important that after research is done, that the results of the research should reach people on whose lives the study could have an impact. Although the Pula Imvula is a great medium to get information to the readers, we felt that a one-day training course to members of the Jobs Fund project could bring the information home to the farmers and hopefully influence the way they manage and store their maize after the harvest. Through funding of the DST, we were able to present a one day training course to 95 groups of farmers, reaching more than 1 700 farmers who produce maize for own use, and who sell the surplus to generate an income. During the courses, the farmers were taught to recognise the different mycotoxins and to understand the conditions under which they flourish. As many of the farmers live with the contamination, it was essential to spell out the risks involved in exposure to them – some are carcinogenic, some cause kidney damage, some cause the early onset of puberty in girls, while other cause vomiting and headaches, etc. One of the most important aspects of the courses was to teach the farmers how to harvest and store the maize to minimise the infections, but also to sort, remove and wash the maize before it is used for consumption. These practices can reduce the contamination greatly and thereby improve the health of the rural farmers. One of the requirements of this project which is partly funded by the Jobs Fund (National Treasury) is that all the fields of all the farmers need to be mapped. This is a huge job as each farmer could have a number of fields and there are more than 3 800 farmers on 5 200 ha. Santam generously agreed to buy 37 devices recommended by the BFAP team as ideal for the purpose. 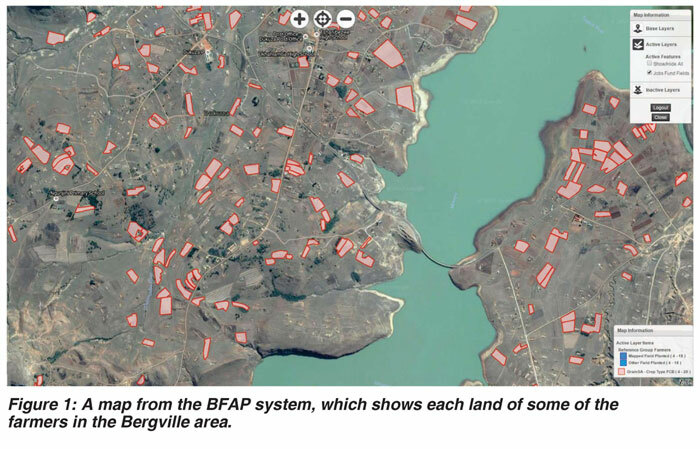 Figure 1 shows a map from the BFAP system, which shows each land of some of the farmers in the Bergville area. While the mapping is being done, the same device takes a photo and is also used to capture information on the farmer and the field. All this data is recorded on the BFAP system for later use in the programme. This picture shows the large amounts of land not being used for crop production in these areas – there is room for the expansion of the programme! Photo 3 is an example of the information that we have on each farmer – his/her photo, a photo of the condition of the land when the mapping was done, a map of the land with the co-ordinates, showing the accurate size of the land, as well as a photo showing the land relative to the area. To our knowledge, there are no other farmer support programmes that have this geographical detail on all their members. The devices (Photo 4) have been carefully selected for the features required – they have a long battery life and a large memory. Many of the areas where these farmers have their fields do not have satellite connections and so the mentor needs to be able to do the work and then only sync to the BFAP system when they reach an area that has good connections. The devices are also set up in such a way that the mentor has to be within ten meters of the field to be able to take a photo of that field – this prevents a photo being loaded under the name of a farmer that is perhaps not that farmer’s field. The devices are also used to gather the type of information about the farmers that are indicated in graphs – the impact of this project is far greater than simply household food security. The fact that so many of these farmers are very poorly educated means that they cannot get jobs – being able to use the land to generate an income is their only option. Most of the farmers in the project are in the ‘older’ categories – this also means that they do not have many options for income generation. The farmers also sell a lot of their produce locally – improving the food security of the other members of the local area too. The farmers who are part of this project have been growing and harvesting maize in a very rural and primitive way. In the past, they were able to thresh the crop by hand because the yield was so very low. However, with the improved inputs and production methods, these farmers are no longer able to thresh the volumes by hand. AfriCA Implements in Bothaville manufactures a small diesel powered threshing machine and we have been fortunate to be able to acquire some for the farmers through funding from Silostrat in Welkom and the DST. The need however is great and we are very thankful to Santam Agri to have funded another six threshing machines.